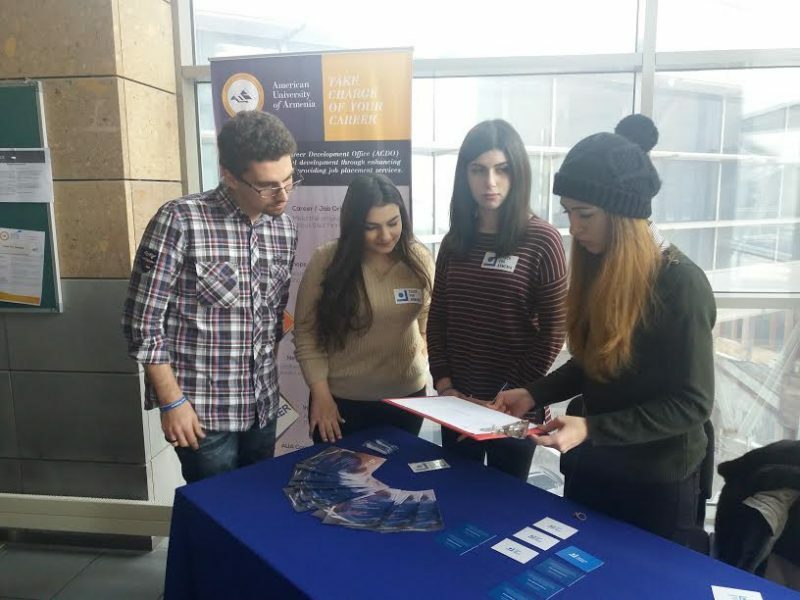 YEREVAN, Armenia – On February 8, representatives from Teach for Armenia met with AUA students to discuss the organization, its vision, mission, and goals. The event was organized by the AUA Alumni & Career Development Office (ACDO). Today, tens of thousands of children in Armenia are being left without the skills they need to pursue higher education and attain financial security. Teach For Armenia serves children in specific communities that lack access to high-quality teaching and educational opportunities. According to statistics, an estimated 40% of schools in these communities face severe teacher shortages. To address this crucial issue, Teach For Armenia leverages the energy, enthusiasm, and drive of exceptional university graduates to infuse great teachers into Armenia’s most disadvantaged schools and to cultivate lifelong champions for educational excellence. With this in mind, Teach for Armenia representatives met with AUA students to explain the organization’s process from training transformational leaders to how they are then placed in schools as Teach For Armenia Fellows serving low-income communities. Teach For Armenia invests heavily in supporting these Fellows so that they succeed with their students and gain the knowledge and mindsets necessary for long-term leadership. During the event, representatives stressed that graduates do not have to have a degree in teaching prior to applying to the program. Each applicant simply needs the desire to teach and shape a nation. The ACDO is proud to continue fostering ties between AUA students and organizations that bring about positive change in Armenia and remains committed to serving as a strong platform for many more such engagements and events.